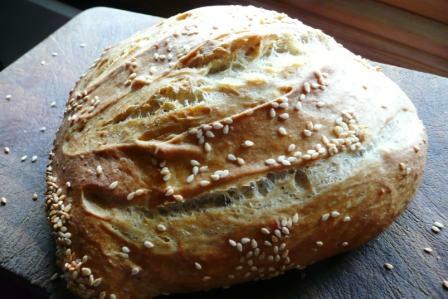 Just sharing my latest effort – a boule made with olive oil dough, cornflour wash and sprinkled with sesame seeds. I’m starting to get the hang of the all-important “slash” technique. Note those wonderful gluten strands, result of a slow rise: you won’t get this from a bread machine. Mmm! Looks good 🙂 I found this blog looking for information on the olive oil dough in _Artisan Bread in Five Minutes a Day_. Did you use the book’s recipe for this? I may have to try your Chorizo bread. That looks wonderful (though I don’t know what Chorizo tastes like)! Lindsay – Yes I did use the Olive Oil Dough recipe in Artisan Bread in Five Minutes a Day; it’s brilliant. As for chorizo: it’s salami-like but with a spicy, smoky paprika aroma and a little garlic; delicious if you enjoy such things!